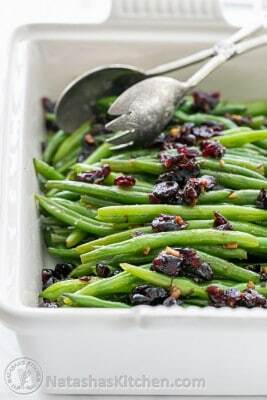 These green beans are so flavorful, quick and simple to prepare. The dried cranberries really dress the beans up, giving them that special occasion quality. You can also use the petit (skinny green beans), but they will cook slightly faster. Fill a large soup pot 2/3 with water and bring to a rapid boil. Add 1 Tbsp salt, 1 Tbsp lemon juice (or vinegar), and 2 lbs trimmed green beans. Partially cover and boil 6-7 min or until crisp-tender, drain and rinse with cold water to stop the cooking process. In a large heavy-bottomed skillet, over medium heat, add 4 Tbsp olive oil, minced garlic and 1/3 cup dried cranberries. Saute 2 min or until garlic is golden and fragrant. Stir in the green beans and drizzle with 1 Tbsp soy sauce and add garlic salt to taste.